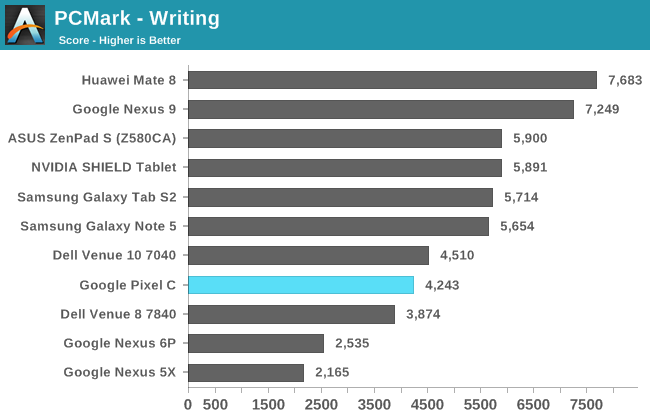 One of the highlights of the Pixel C is the fact that it is powered by NVIDIA's Tegra X1 SoC. This technically isn't the first time that X1 has shown up in an Android device since it powers the SHIELD Android TV, but it's the first time it has been used in a mobile device. This implementation of Tegra X1 has four Cortex A57 cores with a peak frequency of 1.91GHz, along with four Cortex A53 cores. There are a few things that need to be mentioned about how Tegra X1 differs from other SoCs with eight cores. The first is the fact that in theory, Tegra X1 uses cluster migration rather than Heterogeneous Multi-processing. 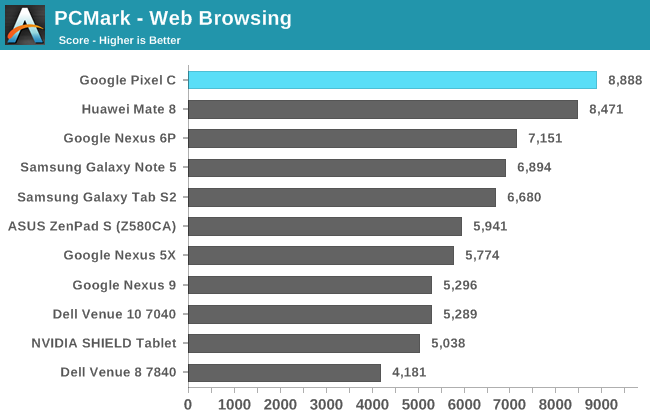 The reason I said in theory is because the implementation in the Pixel C is really only using the A57 cluster and scaling the frequency as low as 51MHz and as high as 1.91GHz. 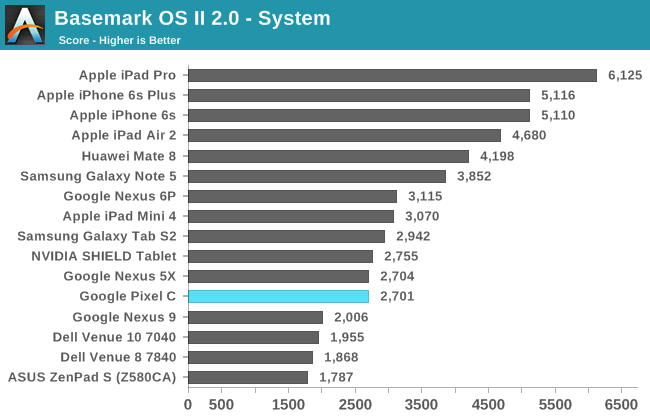 The Pixel C only achieves decent results in BaseMark OS II. The NAND memory score definitely drags down the overall rating, with the web score being lower than expected, and the system score being shocking low. 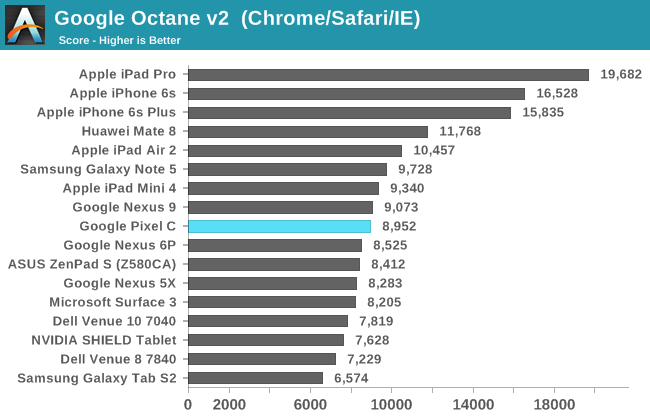 The stand out score is in the graphics test, with the Pixel C only coming second to Apple's iPad Pro, and beating out the next best Android device, which is also NVIDIA-powered, by a huge margin. 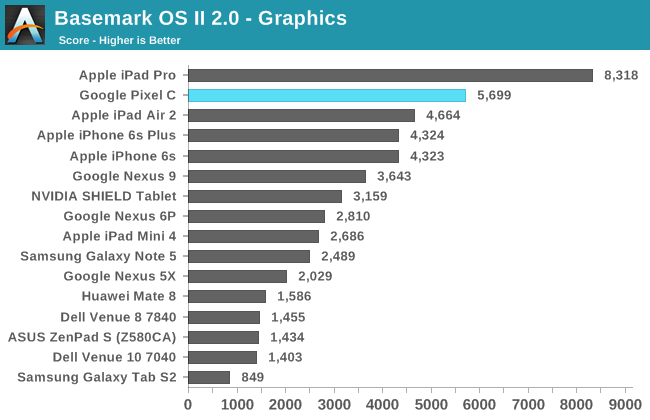 Unfortunately, high as it may be, Tegra X1's graphics performance just isn't enough to carry the Pixel C here. 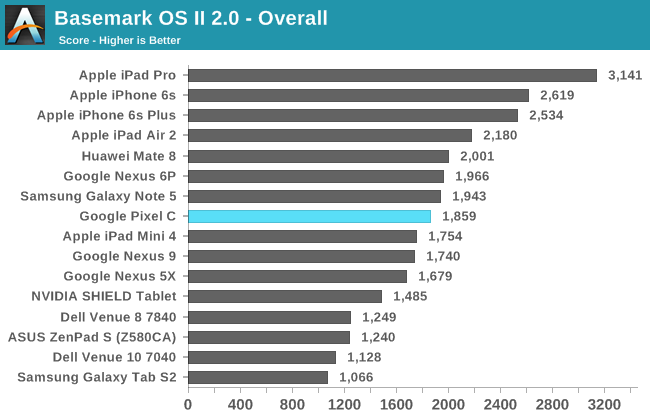 PCMark paints a different picture than BaseMark OS II, and highlights how performance can be highly variable based on workload, software, and whether an app is run as a native binary or through ART. 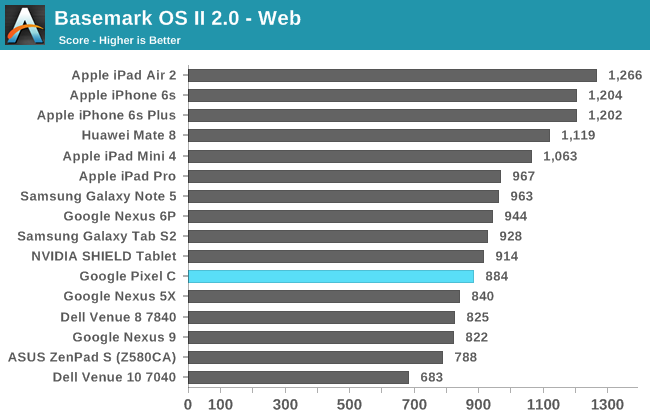 In PCMark the Pixel C performs exceptionally well, with the exception of the writing test which seems to have been impacted by some change made to ART on Google's devices when moving to Marshmallow. Putting that aside, we see quite high and often chart topping scores in the remaining tests, resulting in a final score that only sits below the Huawei Mate 8. 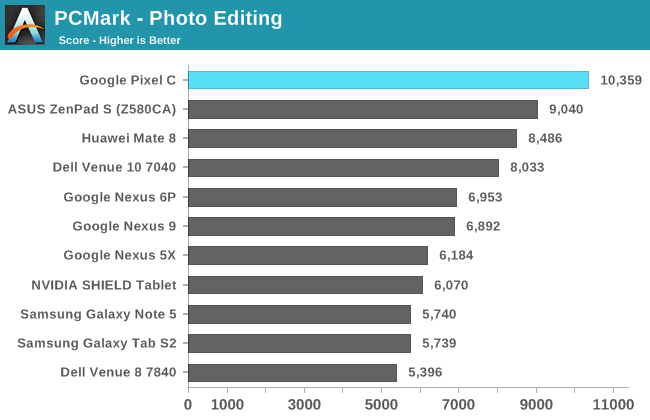 Characterizing the Pixel C's performance is difficult. PCMark paints a very good picture, and I'm tempted to lean toward it as it is representative of the tasks that users will perform on a daily basis. 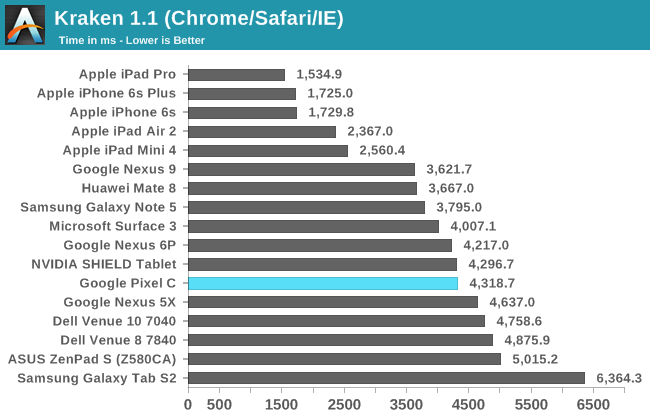 There's a bit more discussion to be had about the Pixel C's general performance, and that'll come a bit later in the software section of the review. 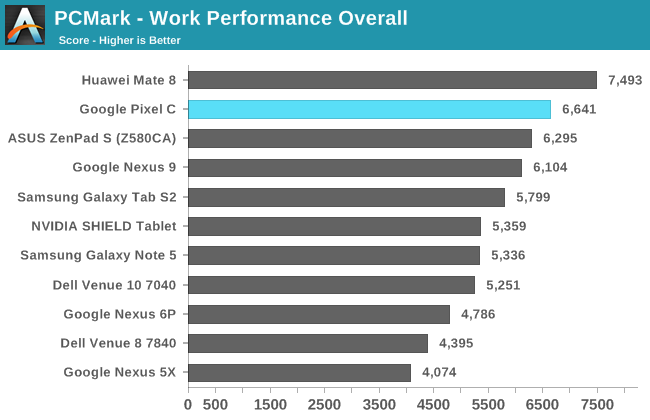 What I can say is that Tegra X1 certainly is fast as far as raw speed goes, but there's more to be said about the Pixel C's performance when you consider the role of both hardware and software. Not going to happen. The Google ecosystem is focused on ignorant third-world consumers that think more cores are somehow better than faster individual cores. It's a problem of Google's making, where they have the mistaken belief that targeting the poorer class will somehow make their products superior against those that target the upper-class, like Apple. Yeah, Asia's obsession with core count is quite curious. In Spain apple has a 9% marketshare. Spain has almost 50% youth unemployment. 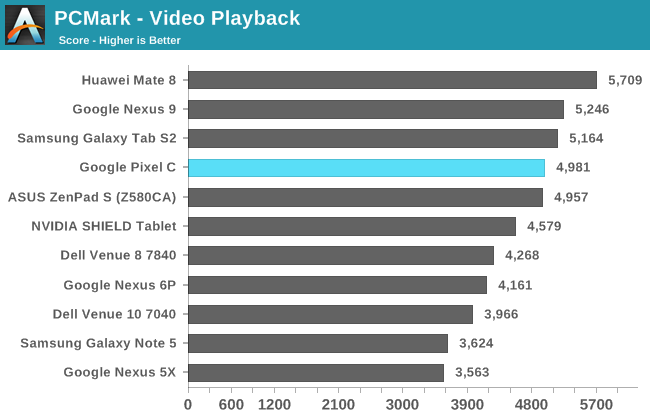 As such its not hard to see why their tech preferences favor cheaper hardware originally destined for the 3rd world. Exactly. You have to look at purchasing power of a nation. Apple markets to the young and wealthy upper class. 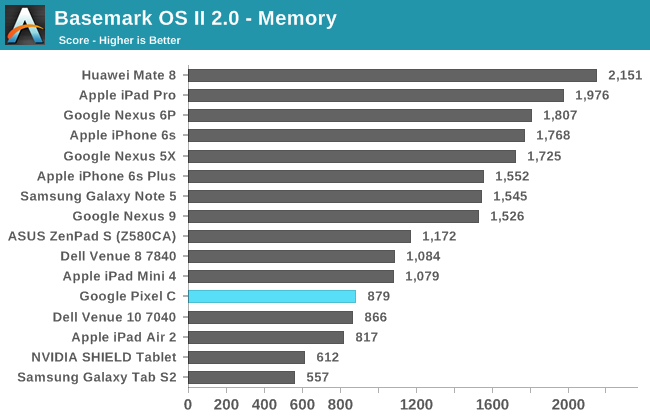 There's a reason Apple only has 5-6% of the market share. But 90% of profits, and 90% market share in the $1000+ computer category is because they refuse to pander to the lower segments of the market. 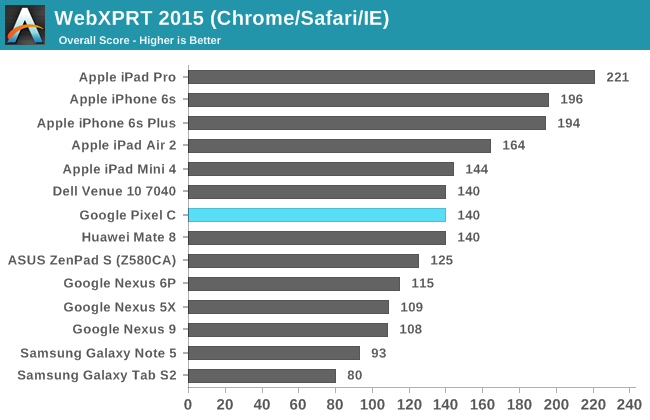 If you want the best, can afford it, and are tech savvy, you get a Surface Pro or similar top-tier device.